The move reflects Russia's interest in attracting western partners to lay a new pipeline through Turkey, experts say. 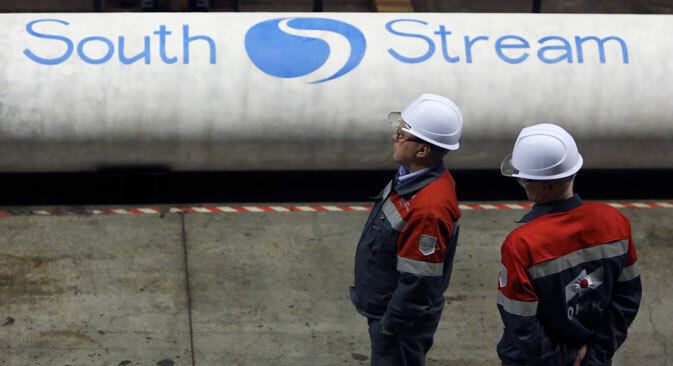 Gazprom has paid its European partners $1 billion for shares in the South Stream pipeline project, according to a Gazprom report published late last year. The 2014 report reveals that Italy's ENI, French company EDF and the Germany's Wintershall were paid a total of over 52 billion roubles (around $1 billion at December 2014 exchange rates) for their shares in the cancelled South Stream gas pipeline project. Experts believe that Gazprom was motivated by a desire to maintain good relations with its European energy partners. "Now Gazprom is the single owner of all [South Stream's] property and assets," said Ivan Kapitonov, deputy head of the State Economy Regulation faculty at the Presidential Academy of National Economy and Public Administration. Kapitonov believes the pipes that have already been bought for the South Stream project can be used for the Turkish Stream project. In the beginning ENI announced that it would be Gazprom's partner in building the marine sections of South Stream (50 percent), but later ceded 15 percent to Wintershall and another 15 percent to EDF. Gazprom is keen to keep a contract with Italian construction company Saipem for laying the pipelines within the framework of sanctions imposed by the EU against the Russian oil and gas industry, according to Russian news agency Interfax. The Italian government had already given Saipem permission to lay the pipeline in the Black Sea and the company's pipe-laying fleet remains docked at the Bulgarian port of Burgas. Saipem's main shareholder is ENI, explaining Gazprom's decision, Kapitonov said. Dmitri Baranov, an expert at Finan Management said Gazprom's move made sense. "It is one thing to share risks in a project among all the shareholders and another when the main shareholder unilaterally closes the project," he said. Baranov added Gazprom did the right thing by paying compensation to the other shareholders. South Stream's proposed Black Sea seabed lines were designed to pipe up to 63 billion cubic metres of gas annually to Bulgaria and onwards to southern European countries, including Serbia and Macedonia. However, the Russian company abandoned the project because Bulgaria had stopped work on the pipeline on orders from the European Commission, which said Gazprom's role as both gas producer and owner of the pipelines breached EU competition rules. The new Turkish Stream project, which is not subject to those restrictions, will also pass through the Black Sea, but to Turkey instead. Russia and Turkey have agreed to lay pipes across the same marine sections as South Stream for the first 660 kilometers, meaning Gazprom will not need to spend money on new marine studies. The pipeline will then turn towards Turkey's European shore. Marine geology studies for that part of the new pipeline are due to start as soon as Turkish permission is granted, Gazprom says. The study has been delayed by Turkish demands for a discount. Gazprom and Turkey's Ministry of Energy and Natural Resources have agreed the key points of the trajectory for the Turkish section of the pipeline and discussed technical specifications. The pipeline will make landfall near Kiyikoy and cross the Turkish-Greek border at Ipsala. Gazprom is in talks with the Greeks for the route the pipeline will take in Greece.